Credit card issuer and major bank Chase has been one of the highest profile Apple Pay partners since the service was announced in September and launched one month ago. This weekend, the bank has launched a plan to entice more Chase Visa card holders into Apple Pay with a free early-access music download. From November 21-23, users who add a Chase Visa card into Apple Pay will receive exclusive early access to David Guetta's new album "Listen." 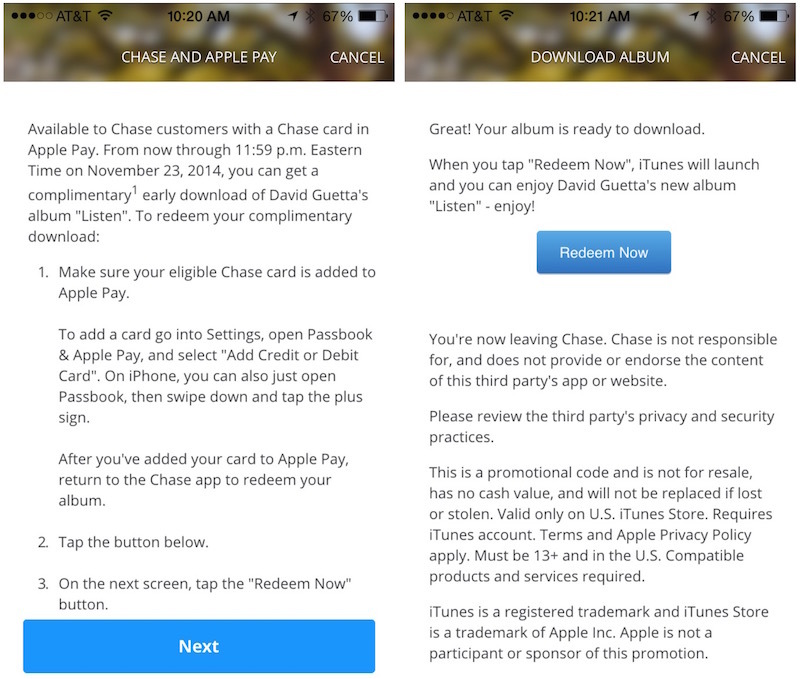 Apple Pay users can receive their iTunes Store redemption codes through the Chase app, which received an update today that is required for the Apple Pay promo to appear. The new album from Guetta officially launches on Monday, and is currently available for pre-order through the iTunes Store for $11.99. Chase is not the first major bank to try to entice customers to try out Apple Pay, with Wells Fargo offering $10-$20 credits just for making an Apple Pay purchase on a Wells Fargo card by the end of this month. Apple Pay has seen a number of other enhancements in recent days, including the addition of in-app Apple Pay support in the Disney Store app, another of the service's key partners mentioned alongside Apple Pay's unveiling. Apple Pay had already been accepted in Disney's retail stores, with Apple's own Eddy Cue showing off the service in a Disney Store earlier this week.Version 3.2.1 of the company's app, landing just before the holiday season rush, brings support for Apple Pay for the iPhone 6 and 6 Plus. Despite Apple Pay being supported available for the iPad Air 2 and iPad Mini 3, the iPad version of the Disney Store app does not yet include it. Another of Apple's early in-app partners, Levi's Stadium, rolled out Apple Pay support earlier this week as well for visitors to the San Francisco 49ers home stadium in Santa Clara. On the in-store front, a number of new retailers also rolled out support for Apple Pay, including several grocery store chains and just today Sephora announced (via TechCrunch) an early rollout in its Manhattan and Bay Area stores ahead of a full rollout in the near future. Sephora will initially accept Apple Pay at its Union Street and Powell Street stores in San Francisco, Valley Fair store in Santa Clara, Stanford store in Palo Alto, Burlingame store in Burlingame, and Lexington store in New York City. With the recent release of the WatchKit SDK for Apple Watch to app developers, and Apple's promise that Apple Pay and the Apple Watch will be closely tied, the retailer and app support of Apple Pay will no doubt continue to grow. The Chase Mobile [Direct Link], Levi's Stadium [Direct Link], and Disney Store [Direct Link] apps can all be downloaded from the App Store for free. Update 8:41 PM: Apple has sent out emails to customers acknowledging an issue with the original redemption codes not providing the full album and including a new redemption code to obtain the remaining four tracks from the album free of charge. Very clearly in the OP, you have to go download it manually, like with StarBucks app weekly promo's. This isn't shoved down people's devices unwanted. ...Or maybe you didn't read the MacRumors post above. Swing and a miss Chase. Good thing your Sapphire card is awesome enough to be worth it anyway. It's free, some will like it, the others can ignore it. Uh oh - free albums. Raise the alarms! It's right in the title and in the article... it's says "David Guetta". If you're trying to figure out who that is... there's Google or Bing. These search engines usually are great ways to find out information that you're lacking and in need of. Yaaaasss, get that promo Chase. I used Apple Pay for the first time other day to pay for my fries, and it was everything mobile payments should be. Agreed. I much prefer your more original works that the majority of people have yet to really discover and properly appreciate. What was the name of your album again? I like Wells Fargo's offer better: cash credit the first time you use Apple Pay on one of their accounts. $20 for credit, $10 for debit.